Africa: Does Democracy Improve Your Health? Back in the 1990s, the Nobel-prize winning economist Amartya Sen famously wrote that “no famine has ever taken place in a functioning democracy”, coining an argument has shaped thinking across countless sectors – and none more so than healthcare. If governments face open criticism and are under pressure to win elections, we assume, they are incentivised to improve the health of their populations. Dictators are not. She argues that democracies entrench longer-term reforms than their dictatorial counterparts – often involving universal healthcare or health insurance schemes. In 2003, roughly a decade after entering a multi-party democratic system, the west African country hiked VAT by 2.5 percent to fund a national health insurance programme. Voters who had been overstretched by the previous ‘cash-and-carry’ system happily swallowed the tax increases, and the scheme was so popular that when the government unexpectedly changed in 2008, it survived the transition. “Several of the countries that are seen as the big success stories in public health are not very democratic,” argued Peter Berman, a health economist at the Harvard School of Public Health. Take Rwanda. Led by Paul-Kagame’s decidedly authoritarian Rwandan Patriotic Front, the country is considered “not free” by Freedom House. In the run up to 2010 presidential elections Human Rights Watch alleged political repression and intimidation of opposition party members against the leadership. Yet the government has a strong developmental track record. “Rwanda started out with somebody who is autocratic, but who genuinely wants to see these indicators change,” Grépin said. Over the last decade, Rwanda has registered some of the world’s steepest healthcare improvements. After the 1994 genocide – when national health facilities were destroyed and disease was running rampant – life expectancy stood at 30 years. Today, citizens live to an average of almost double that. Deaths from HIV, tuberculosis and malaria have each dropped by roughly 80 percent over the last 10 years, while maternal and child mortality rates have fallen by around 60 percent. Like Ghana, Rwanda runs a universal health insurance scheme, though it has fared better in its roll out. Upwards of 90 percent of the population is covered by the community-based Mutuelles de Santé programme, which has more than halved average annual out-of-pocket health spending. “By decreasing the impact of catastrophic expenditure for health care we increase the access,” explained Agnes Binagwaho, minister of health, from her Kigali office. The benefits of that programme are clear to see at the bustling Kimironko Health Centre, which is a 20-minute drive from central Kigali and deals with most of the suburb’s non-life threatening medical complaints. In the reception, thirty-year-old Margaret Yamuragiye, a slender sociology student who has been diagnosed with malaria, waits patiently for her prescription. “Before I got my Mutuelles card I would fear that I could not go to the clinic because it would be too expensive. Today if I have simple cough or flu, I come to the doctor, I don’t wait to see if it gets worse,” she said. Nearby in Ethiopia, another autocratic regime registered by Freedom House as “not free” is also clocking significant health improvements. Like Rwanda, leaders in Addis Ababa have little time for political opposition, but are registering impressive developmental gains. “They’re not very democratic but they have the power and authority to allocate resources towards population health needs,” Harvard’s Berman said. There’s no universal coverage scheme in Ethiopia, but government has opted to focus on deploying basic healthcare services across hard-to-reach rural areas. Starting from a pitifully low base, it has spent a decade training a network of around 40,000 extension workers to bring care to rural communities. Over ten years, the nation registered a more than 25 percent decline in HIV prevalence, according to a 2012 progress report. Under-five mortality has declined to 101 deaths per 1,000 live births in 2009/10, from 167 in 2001/2. Infant mortality halved in the same period. Those examples should be evidence enough that the relationship between democracy and improved healthcare isn’t a simple one. “There are autocratic governments that care about the people and there are autocratic governments who don’t. There are democracies where politicians respond to a broad public demand, and then there are democracies where the politicians respond to narrower interest groups,” Berman said. This entry was posted in Africa Healthcare, Child Deaths, Democracy, Global Health, HIV/AIDS, Maternal Health and tagged Amartya Se, Ghana, Kenya, New York University, Rwanda on November 18, 2013 by disabilityaidabroad. Pneumonia kills thousands of Ugandan children every year. A new vaccination programme aims to defeat the illness. Uganda is rolling out the immunisation against pneumonia using a new vaccine called Pneumococcal Conjugate Vaccine (PCV 10). The vaccine has been introduced to mitigate the high infant and childhood death rate and illnesses due to lung infections. Pneumococcal Conjugate Vaccine was first introduced in sub-Saharan Africa two years ago. In Kenya and Ethiopia the vaccine was introduced in 2011. Madagascar and Mozambique started using this vaccine in 2012. Uganda and Zambia are introducing the vaccine in their routine immunisation programme this year. 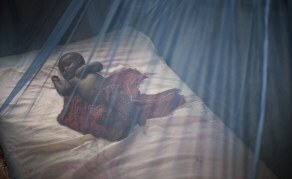 Pneumonia is the second leading cause of infant mortality in Uganda after malaria with 18,000 children below the age of five dying of pneumonia every year. Children under one year are most at risk of getting pneumonia. Factors that expose a child to the lung infection are lack of exclusive breastfeeding, indoor air pollution, poor nutrition and inadequate ventilation. The health ministry’s director general of health services, Dr Jane Ruth Aceng, says the introduction of PCV 10 into the routine immunisation programme will prevent more than 94,071 new cases and save more than 10,796 lives per year. “Children have been suffering from pneumonia without any measure of prevention, and we are happy that the government of Uganda in collaboration with GAVI [a coalition of children’s health NGOs] in introducing this new vaccine free of charge for all children under one year age” she says. Children will get three doses. Infants will receive the first dose at six weeks, another at 10 weeks and the last dose at 14 weeks after birth. Unicef’s Dr Irene Mwenyango says the drug is safe, free and effective against diseases caused by pneumococcus bacteria. It will offer immunity against infection of the brain covering (meningitis), infection of the lungs (pneumonia), bacteria in blood (bacteraemia), ear infections among others. A total of 1,521,061 children are expected to be immunised this year across the country. Uganda has low immunisation coverage with only 52 per cent of children fully immunised, so half the child population at a greater risk of being wiped out by preventable killer diseases. This is attributed to inadequate community sensitisation and mobilisation. And a sect calling itself 666 is reported to be campaigning against immunisation in rural areas, telling parents and guardians it is not safe. The government has vowed to deal with them since their message is confusing parents. It is estimated that 17,216,000 euros will be spent on the new drug. Under the cost-sharing arrangement, the government of Uganda will contribute 919,000 euros while GAVI is contributing 16,296,000 euros. According to the World Health Organisation (WHO) pneumonia is the world’s leading cause of child deaths, killing an estimated 1.2 million children under the age of five every year, more than Aids, malaria and tuberculosis combined. This entry was posted in Africa Healthcare, Child Deaths, GAVI Alliance, Pneumonia and tagged Child Deaths, Disability Aid Abroad, International Disability NGO, Pneumococcal Conjugate Vaccine, World Health Organization on April 29, 2013 by disabilityaidabroad. NAIROBI, 18 April 2013 – The cost of vaccinating children with the pentavalent vaccine – a five-in-one formulation – is set to drop significantly following a deal between the GAVI Alliance and an Indian drug manufacturer that is reducing its price by 30 percent. 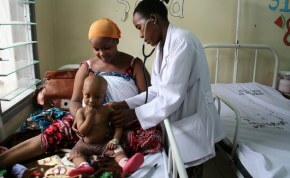 “Working to secure price reductions means we are able to make our funding go further, reaching more children and protecting more lives,” a GAVI Alliance spokesman said. This entry was posted in Biological E - India, Child Deaths, GAVI Alliance, UN Millennium Development Goals and tagged Child Deaths, Global Health, International Disability NGO, Pentavalent Vaccine, World Health Organization on April 22, 2013 by disabilityaidabroad. Although she is 14 years of age, *Lisa cannot eat by herself or talk. She does not play with other children either, and needs help with basic activities. Therefore, her parents tie her to a tree because they feel it is the only way to keep her safe. Lisa, 14, spends her day tied to a tree near her parents’ home in Nateete, Uganda with a rope. The rope is fastened onto her right leg. When she is not tied there, the rope remains. The tree is now known as Lisa’s tree. This is not another case of the nodding disease. Lisa is deaf and mute. Her parents think tying her to the tree is the best way to manage her. While there, she keeps on moving around it. From time to time, she picks anything on the ground and puts it in her mouth. Her sisters keep on removing leaves and sticks so she has nothing to put in her mouth. But that doesn’t deter her from searching for something else. She tries to go as far as her rope allows her and when she finds nothing, she continues moving around the tree and sits down when tired. All this she does while making sounds similar to that of a goat bleating. Perhaps the saddest part in this story is that this slender and tall teenager was not born with any abnormality. “She was born normal and could talk and hear. But when she was two years old, she got malaria and got a seizure. Since then she lost her sense of hearing, talking and she sees only partially,” her mother *May Nakato, says. She says that even when Lisa was older, she couldn’t sit like other children of her age. Someone advised them to take her to a traditional doctor who advised that a hole is dug and Lisa sit in it for a couple of hours a day with a blanket wrapped around her to keep her straight so as to strengthen her back. After three months, she could sit and even started walking. However, she still couldn’t see well, and when she walked, she kept on bumping and knocking whatever was in her way. That is when her parents started tying her onto a rope. The seizure 12 years ago was the start of the family’s trips to hospital. Lisa has since been in and out of the hospital. Sometimes she is put on drip. One time she needed a blood transfusion and once, had to be put on oxygen. Usually, she is discharged after staying in hospital for about a week. The doctors recommended that she is taken to hospital every month for medication saying it would stop her from eating dirty things which the mother says was done for six months. But the parents say there was no change so the teenager continued to spend the day tied on to the tree which is dangerously near an electric pole. One day a lady saw the child and told Nakato that what she was doing could get her arrested. Nakato acknowledged that and asked her to help them because they had run out of affordable options. The lady advised her to take the child to Butabika Mental Health Hospital where other children like Lisa stay. “When we reached there, I found that the children there are not in the same state as my daughter. Though deaf and dumb, they can play with balls, go for short and long calls without help. They also feed themselves and walk with a sense of direction,” says Nakato. Unlike them, when Lisa is left to walk, she wanders around like a zombie, moving aimlessly and she usually gets lost. Even when she sees other children playing with objects like a ball, she doesn’t seem to have any interest. She doesn’t join in when urged to or even kick or touch the ball when it is given to her. She urinates and passes stool on herself. When she is given food, she ends up throwing it all over the place because to feed, she scratches it like chicken wasting the food. So she has to be physically fed. But she drinks by herself without taking the cup off her mouth till it is empty and then she throws the cup. Lisa was taken to Butabika for three days and was given medication. But she got a seizure one day so her father, decided to take her to Mulago Hospital where they were told to take her whenever she got a seizure. Though strange at first, the sight of a child tied on the rope is something the neighbours have gotten used to. Her parents have also made their peace with it. It is like a necessary evil. Nakato, a mother of four explains that she has to work to help her husband with financing the home so she can’t stay at home looking after Lisa. Irene Nenduta, a neighbour tried to get help from African Network for Prevention and Protection of Children against Child Neglect and Abuse (ANPPCAN) but wasn’t able to go far. The officials say they think Lisa needs to be taken to a home for children like her but unfortunately ANPPCAN doesn’t know one such. The established ones require that some money is paid, so they are trying to find sponsorship for her. This entry was posted in Africa Healthcare, Child Deaths, Global Disability, Uganda and tagged Africa, Disability Aid Abroad, Global Health, International Disability NGO, Uganda on November 24, 2012 by disabilityaidabroad.